Last January I was on a group trip put together by my local dive shop, Hydrosports, to Nanaimo BC. In short, it was the best cold water diving Ive done, ever. 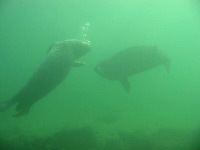 The visibility was really good, at times over 5o ft. The weather conditions were better than expected. Day 1 was cold and clear with ice on the dive boat. Day 2 had only a few light showers part during the morning. Day 3 was mostly sunny with warmer air temperatures. The water temperature was within 1 degree of 45f on every dive. 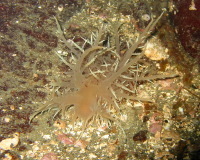 The dive operator we used with was Vancouver Island Dive Vacations, or VIdive for short. Really nice people, comfortable dive boat, great service, and lots of good food all day long. Our package included 2 dive a day with a 3rd dive available in the afternoon. Most everyone went for the third dive. The cost for the extra dive, $20CDN. The briefings were pretty good with one exception (Dodd Narrows). No time limits given by the DM, you were free to dive your dive and end it when you decided it was time. Once you had your gear set up in the morning, you didnt have to change tanks because they had a compressor onboard to fill them at your station. There was Nitrox available on the boat too. Again, almost everyone, including me, was enjoying the added O2. Cost for Nitrox, $4CDN a tank. I would definitly dive with them again. 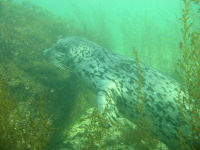 A semi-wall dive with seals in the shallows near the island. Lots of nudies including lemon peel, Hudson's dorid, white lined dirona, and a giant dendronotid. I hadnt seen one before so I didnt recognize what it was. I guess that if they get loose from the bottom they can do a wiggling kind of swimming motion. 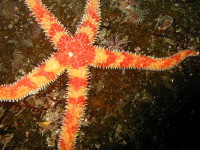 Saw several kinds of star fish; brittle star, painted star, cool purple sea stars, ridged blood star and cookie star. 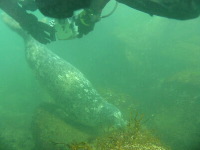 The best part was the seals at the end of the dive. We swam into shallow water near the island, about 15-10 ft deep, and waited. It didnt take long for a couple of harbor seals to show up the check us out. Got some good (I think) photos. The site itself: mooring ball in about 25 ft. slope down going away from the island, leading down towards a wall beginning at around 65 ft. Going closer to the island gets shallower with a bit of rocks that reach the surface before the island and a trough of water about 10 feet deep where the seals were. This was a wolf eel dive. 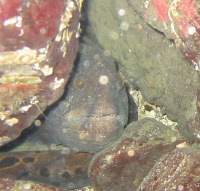 Mooring ball in 65 ft next to a small, but tall, rock reef. We decended along the anchor line to the bottom, and swan over to the base of the rocks to look for the wolfies. It was a small site so it got a bit silted up once several people had plowed (one couple especially bad). Saw 1 small wolfie on the first pass going left, but before I could get a photo, he had retreated into his den. Got to the end of the rock pile, turned back for a second pass and on the way back I found a pair of large wolfies. They didnt want to come out and play and I couldnt find an urchin close by. Then there was one more medium sized which did get photographed. 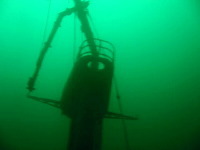 Finished the dive by going up on top of the reef for a look around in the shallower part before heading for the assent line and a safety stop. Next to a small island owned by a rich person. 1 house, 1 large No Trespassing sign, 2 guard dogs. Unbelievably, the house had a 2 car garage, and the captain said there was a SUV in the garage. The dive was interesting in rock structure. Some swim thrus and a few interesting creatures. Mark and I tried to get a giant nudie to swim, but it wouldnt cooperate. Also saw my 1st Puget Sound king crab. It was a juvenile, but I guess they get pretty big as adults. Sunk in 1997, this ship has been overrun with marine life. 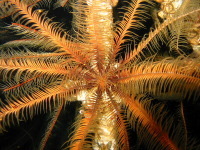 It is a fabulous dive with more than you could see in several dives. The ship itself has nice lines. Great for all kinds of photo types, especially macro. Lots of scallops, a yellow cloud sponge in the wheel house, and lots of fish including big ling cod. Good visibility, 40+ and no current. The mooring lines are tied off at around 50ft and the main deck is around 80ft, so plenty to see without going too deep. I have to come back to dive her again. A huge ship to explore. Top of the main deck is about 90-100ft, but there is superstructure to explore that is shallower. Only been down since October 2001, she is already showing signs of becoming a show case for marine life. For me,the ship itself didnt have as much character as the Saskatchewan. I should have left my camera on the dive boat so that I could have explored the ship better instead of limiting my depth because of the camera housing. I have a Canon A20 with a Canon housing. It has a depth rating of 100ft, but it is probably good for deeper. I just dont want to test that theory personally. The mast is wooden at the top. It looks broken because it is. A police boat caught its anchor on it and broke the mast off. Now it is at 35ft like it is supposed to be. A wall dive with a slight current. Nice anemones and and a new crab sighting, a golf ball crab. I got really cold at the end of the dive, not just my hands, cold to my core. 45 degree F water will do that to you. Good thing it was the last dive of the day. It was after this dive that I decided that dry gloves would be a Good Idea. That night I bought a pair from the trip leader who was test diving some from Diving Concepts. They are GREAT! This was my 100th dive. This time we got set down near the stern and went forward. Dive buddy Bill and I hurried to get in the water first, but we still didnt find the octopus that was supposed to be under a hatch cover on the sterns main deck. We did get to see the captains bathtub this time. A great dive. I was really happy to make this my 100th dive. 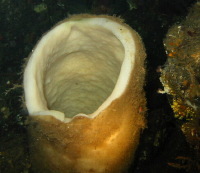 Below is a close up of a sponge I found in the wheel house. There is a teeny hermit crab on it. This is the dive that had the bad briefing. A drift dive gone terribly wrong. We were instructed to exit the boat and swim to the rocks on the shore then descend. Keep the wall on the left and drift, except the current was going the wrong way. It only got worse from there. I know, I should have just gone with the flow. After fighting the current for a few minutes, that is what I decided to try. It would have worked if the current was going in ONE direction, but it wasnt. Up wellings, Down wellings, back eddys, a real mess. It would be a great dive at slack, the walls and rocks were covered with lots of life. The currents through here are so strong and varied that the 116ft Nautilus Explorer got caught and ran aground here last year. Nice pinnacle reef. 2 octos and all the swimming scallops in the world. 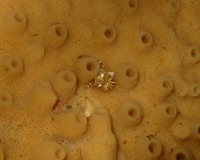 Hundreds, maybe thousands of yellow sponge encrusted scallops. 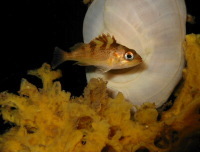 Lots of rockfish and nudies too. Nice variety of stars and a large chimney sponge. A nice dive to end the trip with.